Encens Liquide ~ "The memory of gently wafting ceremonial incense in Japan, soft smoke trailing its mysterious and sultry veil. Soft Amber Resin, White Musk, Black Tea and enchanting Hinoki Incense." Fleur Liquide ~ "The memory of dew soaked flowers at dawn and night blooming flowers just before sunset. Orange Blossom, fresh Mimosa and Night Blooming Jasmine." Amour Liquide ~ "The memory of exhilarating romantic love, at once soul soothing and breath taking. Pure Madagascar Vanilla, Tonka Bean and Incense." Soleil Liquide ~ "The memory of warm sunshine on a dazzling, bright summer day. Fresh Grapefruit, Tangerine, Blood Orange and Neroli Flowers with Santal and White Musk." Vacances Liquide ~ "The memory of a vacation on an idyllic tropical beach with warm, white sand and azure waves lapping the shoreline. Tiare Flower, Fresh Coconut Milk and Tahitian Vanilla with Oceanic accords." The Encens and the Soleil sound so good. Can I get a sample? I don’t know if Studio Beautymix does samples or not. I like the smell of incense, so the first sounds lovely. Maybe Kenzo Amour without the milky-vanilla? I had never heard of Memoire Liquide before. I looked at the old post on their create-your-own-perfume line. As much as I like the idea of creating my own fragrance I imagine the process would be totally overwhelming! Some people really love this line. I’ve only tried a few and wasn’t overly impressed, but would guess it’s great fun to have a custom mix done if you have the time & energy. they all sound kind of yummy to me! I called to inquire about a set of samples—-they said that maybe there’d be a sample set offered closer to the holidays. we would gladly take you in. Of course, I may be penniless by then too…. 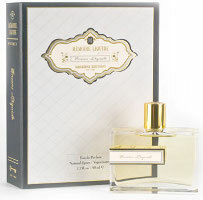 I would love a sample of the Fleur Liquide the aroma notes of the Fresh Mimosa and Jasmine sounds heavenly. Could be. And possibly Beautyhabit will get these…they carry some of the line too. They all sound DELISH, but that Vacances has my poor little soul alight with joyous Maginficence! Sounds UBER-YUMMY! The Amour and Soleil also sound Tingle-worthy! MUST HAVE! HA … save those pennies for the Tom Ford / Amouage fund! Hmm, they do sound nice, especially the Encens one. I really need to slow down on my sampling though … I just got my Ineke sample set and a bunch of Luckyscent samples in the mail today. That will keep me busy for a while! I’ve hit that point too, between a recent LS order and several generous friends. Time to slow down and smell the…samples. Easier said than done, though, because my “must sniff” list is still a mile long (and always growing). Sigh. I know, that’s the thing — it never ends! Somehow those samples arriving in the mail never gets old, though — it’s still a happy thrill! I’ve got plenty to keep me busy too. It just cracks me up how French is used to make things sound fancy. The second fragrance might sound a little different if the name was in English, “Liquid Love,” just doesn’t sound so pretty, does it? I never thought much about this line until I somewhat impulsively bought Mystère de Maroc this past weekend. I assumed that it would be unilinear and a bit boring, but when I wore it to work yesterday, I had multiple compliments. I hope to try a few more of the oils and sample the Reserves. Mystère de Maroc really surprised me! I’m torn between hoping that they are as lovely as they sound and fearing that they will be and that I’ll have to give more plasma to satisfy my perfume habit. Encens and Vacances sound really enticing. And now you have me curious aboud Mystère de Maroc as well, Melisand61! I thought that Mystère de Maroc would just be a sort of rose oil scent with some musky undertones. What a surprise when a pretty slightly spicy/incensey note floated out from behind the rose 15 minutes into its development. I accidentally overapplied it because oils generally don’t have enough sillage for me. I was so wrong. Everyone at work who walked into my office said that the whole room smelled wonderful! I received compliments all day. All of these look wonderful. I’d love to visit their boutique to create some fragrances as well. Just reading from the blends available got my imagination revving. I’d be curious to know if anyone’s tried this line and what they thought of it. Jessica, did you like the blend you created? What did you think of lasting power, sillage, etc? *sigh* If I’m ever planning on visiting NYC, I’m so there. I don’t know if they’re still at Bendels, but they’ve opened at Bloomies, I do know that. OH let me at that Fleur Liquide! Its got my gorgeous night blooming jasmine in it! LOL…that works as a strategy. Oh my frickin gosh!!!! I have finally found the scent i have been looking for over the past 3 years. When i used to walk home from school in spring there were these bushes in everyone’s yards that would bloom tiny white flowers that smelt amazing. i’ve been searching for something similar to these flowers and today i smelt Vacances Liquide and it is exactly them!!! Unfortunately i can’t afford to buy the perfume as i am travelling around australia and am broke think i might get a job next town we stop AHHHHHHH SO EXCITED!! !